With a simple touch, she can see an object’s past. All who have wanted it. All who have owned it. All who have stolen it. Nicola Marter was born with a gift so rare and dangerous, she keeps it buried deep. But when she encounters a desperate woman trying to sell a modest wooden carving she claims belonged to Russia’s Empress Catherine, Nicola knows the truth. There is one with greater powers than Nicola’s, but he’s a man she can neither love nor lose. Together, they’ll pursue answers and perhaps untold rewards. In once-glittering St. Petersburg, the tale of The Firebird unfolds, irrevocably changing all who’ve pursued its secrets. 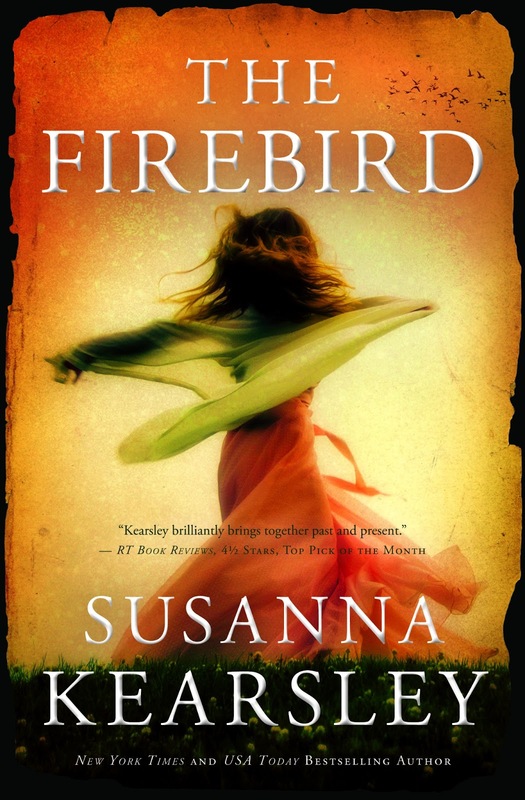 Beloved by readers as varied and adventurous as her novels, you will never forget spending time in Susanna Kearsley’s world. FRESH DYNAMIC: From the opening page, the intimate relationship between Nicola and Rob pulled me in and held my attention. With this novel having a dual story line, I have to say Anna and Colonel Graeme’s scene’s were also very sweet. EMOTIONALLY REWARDING: There were plenty of ups and downs in THE FIREBIRD, enough suspense to keep long-haul readers interested. I felt the middle hundred pages could have been sharper, but I am used to reading shorter, tighter books. Simply a matter of preference. DUAL HEROINES: This is where things get muddy. Who truly is the story’s heroine? Nicola or Anna? Nicola meets her greatest fear head on, but does Anna? IS Anna an active heroine or is she tossed about, merely a feisty observer? FINAL THOUGHTS: This book is a good beach read, but it doesn’t move fast, so settle in with lots of coffee. And Chocolate.